Feature: filter diameter: 25mm, pore size: 0.45um, membrane material: PES , hydrophilic property . 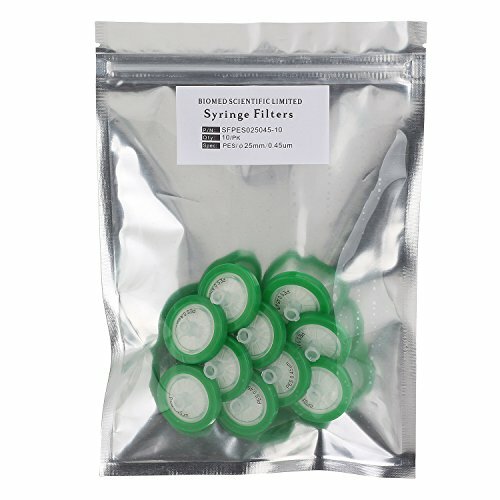 Syringe filters are made of inert plastic house, membrane, and luer lock fit. It is used with disposal syringes or filtration device with luer fit. Syringe filters are often one-time use only. Having low affinity for proteins and extractable. Substantially faster filtration rate than PVDF membrane. Biomed Scientific syringe filters offer universal application for analytical procedures. Hydrophilic PES (Polyethersulfone) suitable for pre-filtration and filtration of buffers and culture media . Hydrophilic; High flow rates; Low protein binding; Low concentrations of extractable substances; Excellent chemical stability; High thermal and oxidative stability.